The Profil analogue clock with its contemporary design fits harmoniously into all kinds of environments. Perfect readability of the time. A clock for professional use with very large reading angle and perfect contrast. 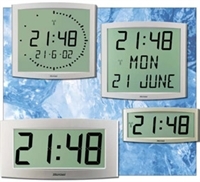 Opalys - Backlit LCD clock for indoor	Thanks to its elegant and sober design, the Opalys LCD clock fits easily into any interior decoration.